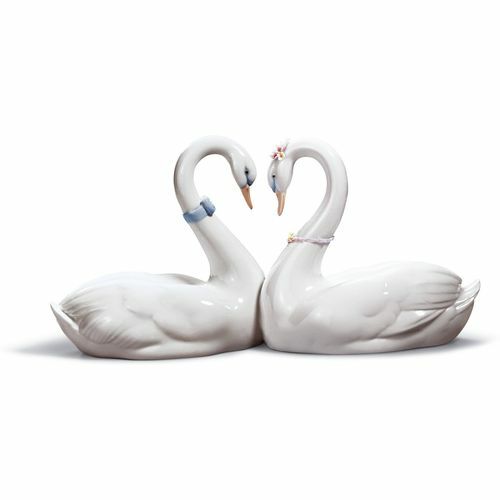 This Lladro piece is a porcelain figurine depicting an pair of elegant swans as they swims along, arching their necks in an intimate pose to form a loving heart shape. Epitomising a tender loving relationship, the white colour connotes purity and peace, and the pastel hues of the blue bow and pink hand-made flowers add a charming splash of colour to the piece. The stunning level of detail in this piece gives it a lifelike quality, completing this wonderful and classic piece from Lladro. Lladro Porcelain is produced by Artisans in Valencia in Spain. Lladro is made for memories, these beautiful classic and timeless creations make the perfect gift for all those special occasions throughout the years and make wonderful keepsakes for family & friends to treasure. Each piece is lovingly handmade and hand painted & comes with their unique Lladro markings by the Valencia Artisans. The Lladro Endless Love comes presented in its Lladro presentation box & a certificate of authentication.